Are you in need of a dentist in Gilbert Arizona? Look no further. Come see us at Power Ranch Dental! Welcome! 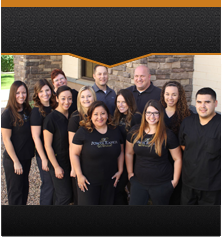 Our practice is located in Gilbert on Power Road in between Pecos and Germann. We love our patients of Gilbert and enjoy helping people feel good about their smiles. Our dental staff is excited to be your encouragement for living a healthy lifestyle and having a beautiful smile. The Power Ranch Dental staff takes great satisfaction in helping you maintain optimal oral health. Our Practice is devoted to comprehensive and preventative patient cars. We hope you choose Power Ranch Dental as your main provider for dentistry. When looking at our website, you will find copious amounts of information about our practice, procedures we provide and dentistry in general. In addition to regular dental checkups, we provide a range of services to our patients including invisalign, teeth whitening, root canals, bridges, crowns dentures, pediatric care and much more. We believe our patients should have as much information as possible in order to make important and, informed decisions regarding their oral health and options regarding treatment. Power Ranch Dental patients are important to us and we strive to develop trusting and long lasting relationships with them. We are always welcoming new patients and would love to have you be a part of our family! Please call if you have any questions or would like to schedule an appointment. We would love to get to know you. You can contact us at 480-988-2282!